When I first got to this farm, it was starting to get really depressing. There are heaps of tasks that need to get done and it seemed like we were just barely scratching the surface. The key to it seemed to be that nearly all tasks that would appear to take just two hours, ended up taking two weeks! But of course you can't tell anybody that. It just sounds like a cheap excuse. 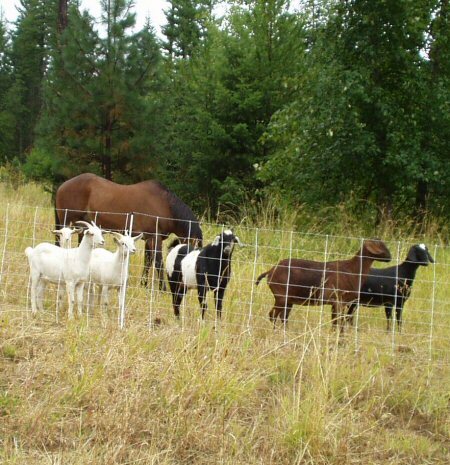 I need to move the goat paddock. No problem. Should take about an hour and a half. Maybe under an hour with a little help. Hey! We're running out of stuff to eat in here! On inspecting where I want the new paddock to be, I thought I should mow where the electric fence would be so that the fence doesn't get shorted out. No problem. 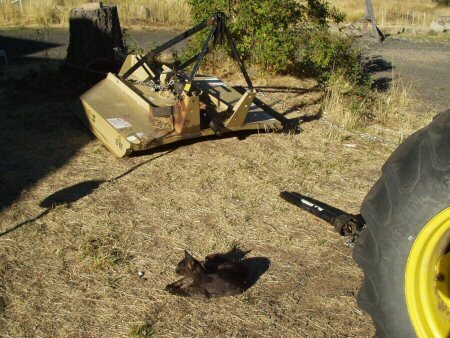 Five minutes to hook up the bush hog and five minutes to mow. The PTO shaft on the bush hog was stuck. An hour is burned up trying all sorts of stuff to get it to budge. Finally I unhooked the bush hog and started taking stuff apart to try and get it unstuck. Another hour is spent trying all sorts of different ideas to get it unstuck. Our trusty, rusty bush hog. Only right now the PTO shaft won't slide forward so we can connect it to the tractor PTO! Here is the pto shaft. It has a plastic sleeve over it to help keep grease in and the elements out. We painted an orange dot on the sleeve so as we're wailing away with sledge hammers, levers, and whatever other strange ideas we could come up with, we could see if we were making any progress. Look there - a zirk is missing. You shouldn't use any equipment that has a zirk missing! As it turns out, the size of the zirks on the bush hog are freaky weird. It took us three trips to town before we learned that we have some kind of bizarre zirk size. I downloaded the manual for our old bush hog from the internet, found the exact size of the zirk in the parts manaual and finally found a company in town that carried that exact size. Fortunately, the find-the-zirk experience was two years ago, so this time we just had to root around in the shop for half an hour to find the extras we bought. Not only is it in a weird position, but the nut size is weird. At first we think it must be metric. But it's bigger than 9mm and smaller than 10mm. 9.5mm we don't have. It's smaller than 3/8" and bigger than 5/16". 11/32" we don't have. Adjustable wrenches don't fit well in the U joint. Finally it occurs to me to flex the U joint so that the zirk is better exposed and now I can get the adjustable wrench in there to do its job. This zirk looks innocent enough, but it's some sort of goofy size. 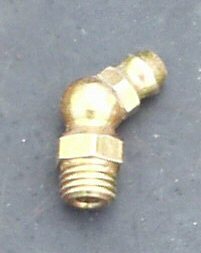 For those of you that might not be zirk savvy: these things will appear all over your equipment wherever periodic greasing is needed. 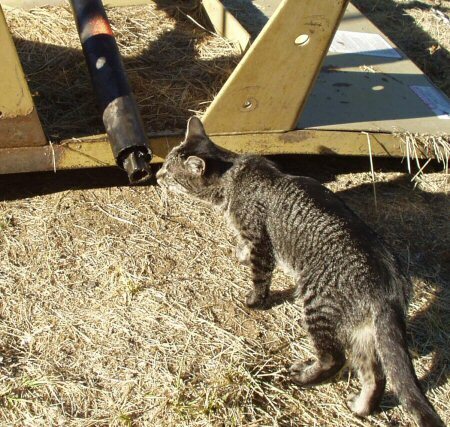 You hook up a grease gun and give a few squirts every few hours of use. There's a kind of springy-valve-thing inside the top part so grease can go in, but not out. It also keeps dirt and rain out. Pretty smart little invention. It's getting dark and looks like rain. Park the tractor under the shelter. 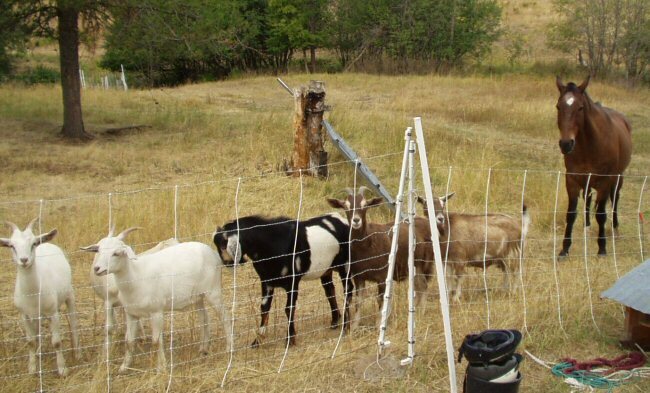 Extend the current paddock a little to give the goats a little more feed until the new paddock can be set up. Next day; fresh start; new ideas! 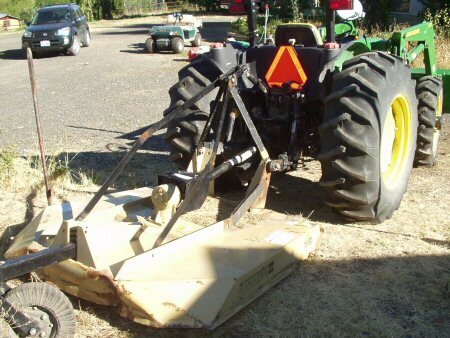 Let's hook the bush hog to the tractor and park it next to a big tree or stump. Put lots of chains on the bush hog end of the PTO shaft and the tree. 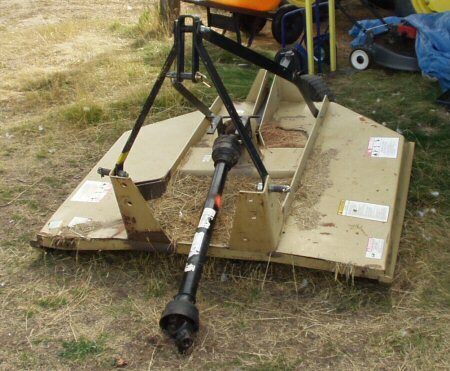 Disconnect the tractor and then attach chains to the other end of the shaft and to the tractor. Pull it apart! Somehow that log pile we ignored last fall slipped in the rain and blocked the tractor in. 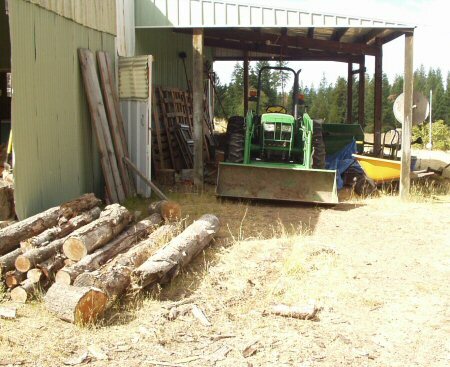 Oh we could just shove it back up on the pile, but then it would just cause more trouble ... Chop enough wood to get at the tractor. The tractor is free again! Turns out that we loaned our second chain to a neighbor over a year ago. When he was using it, a link broke and he needed to make a trip into town to get a repair link. His wife called him at work and he bought a repair link on the way home. Ooops! wrong size! But we found a way to get the second chain to work anyway. Once the chains were hooked up, it took the tractor about two seconds to get the shaft unstuck. Sweet! Well, once you know what you're doing, it sure is easy! A sticky PTO shaft is just no match for the mighty power of a tractor! Now the two pieces were apart. 10 minutes of trying to get them back together wasn't working. A call to a neighbor that has mountains of experience with farm equipment said "look for a notch or something and line the notch up". Worked like magic. Our neighbor reports that a three sided shaft is pretty weird. Four is the norm. One corner is slightly different than the other two and the same can be said for the other part of the shaft that slides over this shaft. Line the oddities up, and it slides right on. All hooked up and ready for action! Hooking up the bush hog and mowing a path around the perimeter of the new paddock takes less than ten minutes. This paddock change involves paddocks that are not connected. Normally, we get the new paddock all set up, then move the animals from one to the other. Unfortunately, we used some of the new paddock fencing to extend the old paddock. So while we have help with setting up the new paddock, all that help is occupied in getting the animals to not wander off. Two hours. Yellow is the old paddock. Green is the new paddock. 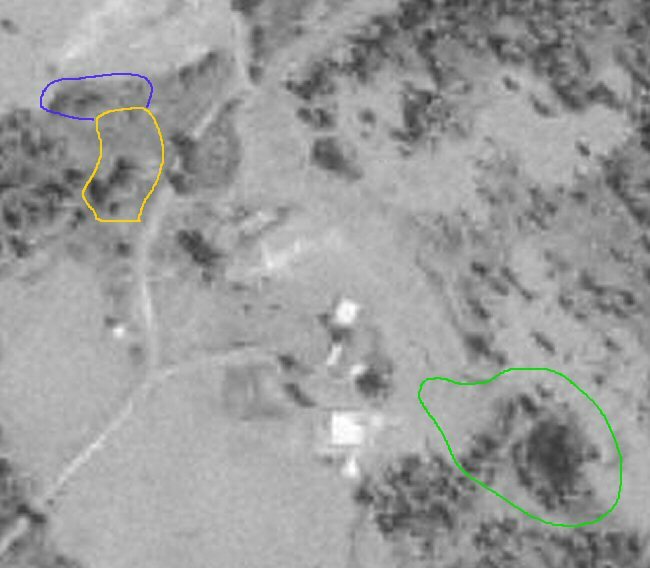 Blue is the old paddock short term extension. Finally! The new paddock is set up!